Disclaimer: Let’s get the legal stuff out of the way first. I received this book from Blogging for Books for this review but all opinions below are my own and I was not compensated for this post. 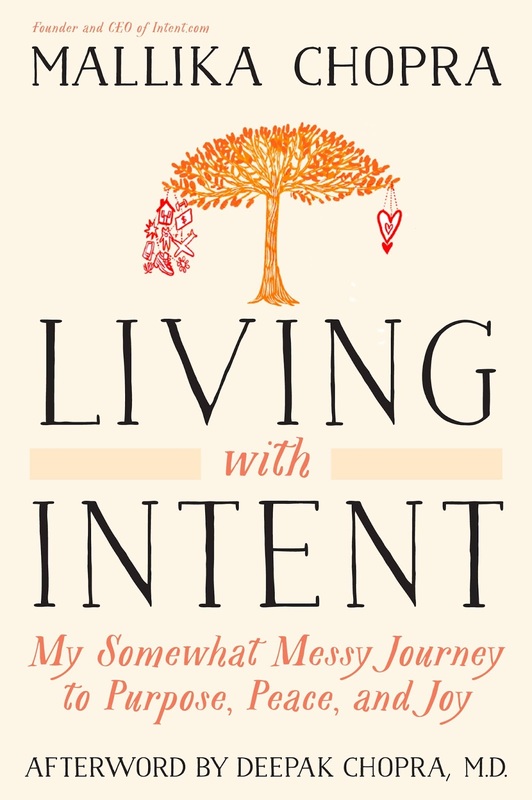 I’ve never done a book review, but I’m excited to share my review of Living With Intent: My Somewhat Messy Journey to Purpose, Peace and Joy by Mallika Chopra. This was definitely the type of book that I needed to read at this point in my life. I’m embarrassed to admit that I don’t read books as often as I should. When I was younger, I lived in the library and I was constantly reading books. I loved the fiction genre and such series as The Babysitters Club, Nancy Drew and Goosebumps. As I got older, reading took a back seat to school, sports, work, etc. I’m happy to get back into reading again. Thank you to Lora for writing about BloggingforBooks on your blog. This was the first time I heard about this awesome company and I signed up immediately! Living with Intent is the third book written by Mallika Chopra. You may recognize her last name and she is indeed the daughter of famous author and speaker, Deepak Chopra. I think the third question is the most important. For those of us with a passion for fitness, I believe its our responsibility to share what we know and what has helped us with others. This is the best way we can serve others that are currently on their own fitness journey. I am a strong believer that knowledge is power! This is something I definitely struggle with daily. I have a very hard time shutting off my brain and thinking of my ever long to-do list. I have taken baby steps toward this by starting to take Yoga. Chopra mentions that meditation is a huge part of the incubate process. I think I may be able to move on to that once I get this whole yoga thing down! Again, something I really need to work on. I constantly feel like I’m always on the go so I just going through the motions – work, gym, eat, sleep and repeat the same pattern every day. Chopra also mentions writing down three things that you are grateful for each day before going to bed. I think this is one thing that I can incorporate into my routine. It’s easy to take things for granted and this exercise teaches you to be grateful and thankful. I have gotten much better about trusting my gut. Sure, sometimes I still doubt myself but overall I try to go with my gut feeling. I think this is especially true for runners. Sometimes your body just needs a break or something doesn’t feel right. In those cases, it’s best to not push yourself or your limits because you may cause injury to yourself. This is one of the reasons that I have my blog. I feel that by sharing my ideas with all of you, it makes me accountable and I’m putting my goals out there into the universe. 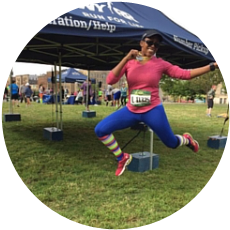 When I et my goal to run 15 half marathons this year I was extremely nervous. I thought to myself “I’ve announced my plans online but what if I fail?” The one thing I do know is that you can’t live in fear, so if you have big dreams or goals, say them out loud! This is SO true! Spending time with family and friends and surrounding yourself with positive people is great for the soul. Another 100% true statement! Similar to the road to success, the path is definitely not straight nor perfect. Also there is no timeline for success, but if you stay on the right path, it will eventually happen. Lately I’ve really been making an effort to control my stress, especially at work. When taking on a new situation or project I tell myself that, at some point, things may get stressful but that there is always a solution for any problem. Let’s face it, stress kills, so we really need to try to limit the amount of stress in our lives. Overall I was so pleased with this book and I now have so many useful tips I can start incorporating to make sure that in my life, I am living with intent. Sounds like an awesome book! Living with intent is so important, but easy to lose sight of in the crazy world we live in! So true! Sometimes we just need to slow down and really enjoy whats going on around us! Sounds like a great book and one that I need to read! !